MISS TOWNE PRAYS at Father Casey's tomb in Detroit and poses with her friend Bishop Scharfenberger (Kate Blain photo). A rare beatification will occur in the United States when Rev. Solanus Casey, a Capuchin Franciscan, is honored in a Nov. 18 ceremony in Detroit. Participating in the rite will be Molly Towne of St. Clement's parish in Saratoga Springs. A deep connection between the saint-to-be and Miss Towne was established in 1984, when she was stillborn at Saratoga Hospital. The neonatologist who delivered her later recalled, "There was no sign of life at birth. She had no heartbeat, made no cry or respiratory effort." As medical personnel struggled to save Molly, her mother, Susanne, sought help at a higher level. "I found myself gazing at my sweet little baby girl all wired up and lying limp in the NICU," she said. "Her survival was by no means sure, and the prognosis was dismal at best." Having been resuscitated, Molly was transferred to Albany Medical Center. There, while recovering from the delivery and remaining close to her baby, Mrs. Towne remembered that she had a scapular with a picture of Father Casey and placed it near her daughter. Mrs. Towne had kept the picture for years. It was given to her by a priest who had introduced her to Father Casey's story. The clergyman, born in 1870 in Wisconsin, spent most of his adult life in Detroit. At his monastery, he became known for his holiness, wise counseling and deep compassion. According to the Detroit Archdiocese, Father Solanus was also credited with miraculous cures: "He spent his life in the service of people, endearing himself to thousands who would seek his counsel. He would provide soup for the hungry, kind words for the troubled and a healing touch for the ill."
When Father Casey died 60 years ago, thousands of people turned out for his funeral. The Detroit archdiocese then began the long process of declaring him a saint. The Towne family never doubted that the priest was a miracle-worker. "Molly's life is itself an incredible [sign] of the intercessory power of Father Casey," Mrs. Towne said. "His whole life is an amazing story of a simple, humble, faith-filled man of God who had lines of people waiting to seek his counsel and prayers." Miss Towne, who was diagnosed with brain damage from lack of oxygen, eventually became able to see and walk. St. Clement's School and other educational facilities in Saratoga worked together to provide her with the special ed she needed. She learned to read, then to sew. She joined her school's basketball team. She graduated from Saratoga Central Catholic High and got a job. Today, the high-spirited young adult is also a cantor at her church and a choir leader at St. Clement's School. Before a recent meeting with Bishop Edward B. Scharfenberger, she teased her mother about needing an alarm clock and declared that she herself doesn't use one, because God wakes her up every morning. Bishop Scharfenberger, who knows the Townes well, said: "I have reason to think that the life Molly is living is an ongoing miracle. "A miracle may be more than something supernatural that 'happens,' changes a life and then becomes one event in history," the Bishop said. "Knowing Molly and her story, I believe that a life-empowering, supernatural grace came to her at the invocation of the intercession of Father Casey - a special grace that continues today." Besides Molly and her mother, the Towne clan includes her father, Stephen, and seven siblings. (Father Casey, also from a large family, had 15 brothers and sisters.) Saluting her husband, Mrs. Towne said, "His devotion, protection and support is always his role. We've been given a sacred trust of keeping Molly safe, secure and free from danger, and letting her know how very loved she is." Through that love, Molly's life has been on an upward trajectory, Mrs. Towne noted. Miss Towne, now 33, works at St. Clement's School at the side of Jane Kromm, principal. "She was the first to bring Molly into her classroom to help," Mrs. Towne said. "Molly reads Bible stories to kindergartners and sings one particular song to them: 'Do not be afraid; I am with you.'" Miss Towne herself believes that "Father Solanus has been with me my whole life. He is my friend, and he prays for me, is always around me. People ask me to pray for them, and I do. I ask Father Solanus to pray for them, too." When she's in church during exposition of the Blessed Sacrament, she continued, "I sense that Father Solanus is with me. I hope he will be declared a saint. I believe [he] was sent to me by God to help me and guide me. I was dead, and I have lived a wonderful life." Her connection to the priest is so firm that, when she sang a hymn in public one time, Miss Towne felt that "I was singing for the glory of God in honor of my special friend. Something very different and special happened while I was singing. I felt something like a 'presence,' something different than I had ever [felt] before. 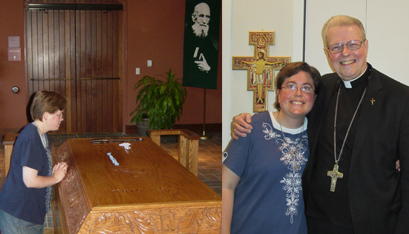 I believe it was Father Solanus letting me know he was right there with me." She is now totally focused on the upcoming Detroit ceremony. "My dad said to me, 'We've got to plan our next trip,'" she told The Evangelist, referring to a family vacation. "I said, 'Can we not? I want to focus on" the beatification. "Is it once in a lifetime? I'm not sure how often people get to do this," she added. At the ceremony, Miss Towne will walk in the Procession of the Relic. Her mother predicted that "it will likely make me cry my eyes out to see my little lifeless baby standing up for her loving friend and protector." Waht a wonderful gift this young has been given, she sounds like the person who will def take that gift of life and do something wonderful with it. She has already done so much with her life, teaching young children to me is the best thing she could ever do. This comment has been hidden due to low approval. I truly believe this she was saved to help ordinary people believe. I worked in a Catholic Hospital and too saw things that were not easy to explain to anyone you just believed and it was so. So happy she can walk in the Procession. God Bless Her and her family This comment has been hidden due to low approval.